Woodbridge, VA-Potomac Nationals RHP A.J. 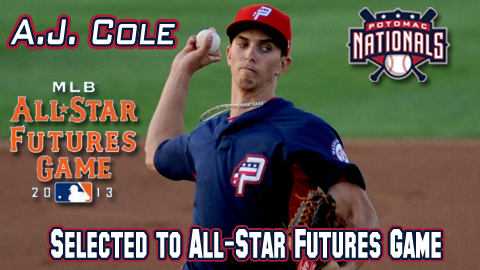 Cole has been selected to the United States roster for the 2013 Sirius/XM All-Star Futures Game, an annual showcase featuring top flight prospects in all of Minor League Baseball, to be held at Citi Field in Flushing, New York as a kick-off to All-Star festivities on Sunday, July 14th. Top farmhands from around the Minors will compete in the annual prospect display that pits prospects from the U.S. squad against the World team. Cole, 21, was originally selected in the 4th round of the 2010 MLB Draft by the Washington Nationals and signed a record $2 million bonus, the highest amount ever given to a 4th rounder in draft history. After logging a MiLB career record of (4-7) and 109 strikeouts in 90.0 innings with the Short-season A Vermont Lake Monsters and the Class-A Hagerstown Suns in his first two professional seasons, Cole was shipped in 2011 to the Oakland Athletics along with C Derek Norris, RHP Brad Peacock, and LHP Tommy Milone in exchange for eventual 20-game winner, LHP Gio Gonzalez. Cole was re-acquired by the Nationals in 2013 in the three-team deal that sent Washington Nationals LF Michael Morse to the Seattle Mariners and summoned Cole back into the Washington fold from Oakland. Cole began the season as Baseball America's number three overall prospect in the Oakland system. In 2013, as a member of the Potomac Nationals pitching stable, Cole has earned a (5-3) record to complement a 4.43 ERA over a duration of 17 starts. Using a mid-90s fastball, a spike curveball, and a changeup with good fade, the fireballer has walked 22 batters and fanned 99 in 91.1 innings pitched. Cole has thus logged a 4.5 strikeout-to-walk ratio and has held Carolina League swatters to a .266 batting average. Cole dominated the Frederick Keys (Baltimore Orioles) as the winning pitcher on June 13th, the evening in which the Nationals clinched their First-Half Northern Division Championship with an 8-0 shutout over their regional rivals. Cole tossed 7.0 scoreless stanzas and allowed just four base hits to the Keys while walking two and fanning ten en route to clinching a 2013 playoff spot for the P-Nats. MLB.com rates Cole as the No. 76 overall prospect in baseball. The All-Star Futures Game will take place Sunday, July 14th at 2:00pm EST inside the confines of Citi Field in Flushing, New York and can be seen live on MLB.com, ESPN2 and ESPN2 HD and followed live on MLB.com's Gameday. The Potomac Nationals of the Carolina League play at Pfitzner Stadium in Woodbridge, Virginia, and are the Class-A Advanced affiliate of the Washington Nationals. P-Nats 2013 season tickets, mini plans, and individual game tickets are on sale now. Sponsorship opportunities for the '13 season are still available. Plan your corporate outing now to see the future stars of the Washington Nationals as the P-Nats offer discounted group rates and all-inclusive picnic options. Visit the P-Nats online at www.potomacnationals.com or call the ticket office at 703-590-2311 for more!